Arizona prohibits all surrogacy contracts, whether paid or unpaid, declares the surrogate as the legal mother and entitled to custody, and establishes a rebuttable presumption that the surrogate’s husband, if she is married, is the father. D.C. prohibits all kinds of surrogacy contracts, declares them unenforceable, and punishes violators with up to a $10,000 fine and/or one year in prison. Michigan declares surrogacy contracts to be void and unenforceable as contrary to public policy, and punishes violations. A party to a surrogacy contract is liable for a misdemeanor punishable by a fine up to $10,000 and/or one year in jail. Someone who induces or arranges such an agreement is guilty of a felony carrying up to a $50,000 fine and/or 5 years in jail. The same punishment applies to anyone involved in an arrangement with a surrogate who is an unemancipated minor, mentally ill, or suffers from a developmental or mental disability. As a further disincentive, if a custody dispute arises, the person who has physical custody (likely the birth mother) may retain it until a court orders otherwise. New York declares surrogacy contracts contrary to public policy, void, and unenforceable. Parties to a contract are subject to a civil penalty of up to $500. People who assist in arranging the contract are liable for up to a civil penalty of $10,000 and forfeiture of the fee received in brokering the contract; a second violation constitutes a felony. A birth mother’s participation in the contract, however, may not be held against her in a custody dispute with the genetic parents or grandparents. Indiana declares surrogacy agreements void and against public policy. But if a parentage determination must be made, courts should not base their best interest analysis solely on the fact that a person entered into a surrogacy agreement. Kentucky declares traditional surrogacy agreements void; does not address gestational surrogacy. Also prohibits compensation for facilitating a surrogacy contract. 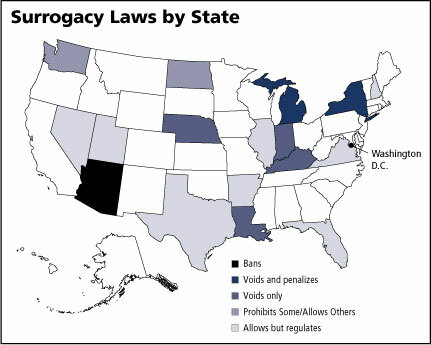 Louisiana declares traditional surrogacy agreements null, void, and unenforceable as contrary to public policy; does not address gestational surrogacy. Nebraska declares surrogacy contracts void and unenforceable. The law assigns rights and obligations regarding the child to the biological father. North Dakota voids traditional surrogacy contracts. If the surrogate is genetically related to the child, then she is declared the mother and her husband, if she is married, is deemed the father. However, North Dakota recognizes gestational surrogacy agreements. Intended parents are the legal parents of a child when a gestational carrier is implanted with an embryo created with gametes from both of the intended parents. Surrogate contracts are generally allowed but contracts for compensation are prohibited. If a dispute arises over a child born to a surrogate mother, the party with physical custody may retain custody until a court orders otherwise. Intended parents can establish their parentage under a valid surrogacy contract. If a child is born under an invalid contract, parentage shall be determined under the other parts of Washington’s Uniform Parentage Act. In contrast, contracts that pay compensation beyond reasonable expenses and contracts with unemancipated minors or women with a mental illness or disability are prohibited. Violation of these prohibitions is a gross misdemeanor. Contracts for compensation also are void and unenforceable as contrary to public policy. Compensation is defined as any payment beyond actual medical costs, other expenses related to pregnancy, and legal fees related to drafting of the contract. Florida regulates traditional and gestational surrogacy separately. Traditional surrogacy is referred to as a “preplanned adoption agreement” with a “voluntary mother” and requires court approval of the adoption. The most important distinction between them is that under preplanned adoptions, the birth mother has 48 hours after the birth of the child to change her mind, the adoption must be approved by a court, and the intended parents do not have to be biologically related to the child. In contrast, under a gestational surrogacy contract, the surrogate must agree to relinquish her rights to the child upon birth, the intended mother must show that she cannot safely maintain a pregnancy or deliver a child, and at least one of the intended parents must be genetically related to the child. Both sets of laws require the surrogate mother to submit to medical evaluation; make the surrogate the default parent if an intended parent who is expected to be a biological parent turns out not to be related to the child; limit the types of payment allowed; require the surrogate to be at least 18; and require the intended parents to agree to accept any resulting child, regardless of any impairment the child may have. Recruitment fees for traditional surrogates are prohibited. Illinois protects unmarried couples and single people as well as married couples under a gestational surrogacy contract.The surrogate may not supply her own eggs and at least one of the intended parents must be genetically related to the child. Under a valid agreement, the intended parents become the legal parents immediately upon birth and the parent-child relationship can even be established before birth (the only state to allow this). A person can bring a challenge to the agreement or the rights assigned under it within twelve months of the child’s birth. The surrogate and intended parents must undergo evaluations and independent legal consultation. If the statutory requirements are not met, a court shall determine parentage based on evidence of the parties’ intent. Nevada allows married couples to enter into a contract with a surrogate for “assisted conception.” Based on the definition of that phrase, the statute applies to gestational surrogacy when both intended parents have supplied gametes. Payment is restricted to living and medical expenses related to the birth. New Hampshire has a very extensive statutory scheme that regulates surrogacy arrangements. The intended parents must be married and at least one of them must supply gametes. The surrogate has 72 hours after birth in which to decide whether to keep the child. The arrangement must be judicially preauthorized, evaluations and counseling of the parties must be conducted prior to impregnation of the surrogate, home studies of all parties must be conducted, all parties must be 21 or older, the intended mother must be physically unable to bear a child, the eggs must come from the surrogate or the intended mother (no donor eggs), the surrogate must have had at least one prior delivery, genetic counseling is required if the surrogate is 35 or older, and there is a residency requirement of 6 months for either the gestational mother or the intended parents. Fees are limited to medical expenses, lost wages, insurance, legal costs, and home studies. Fees for arranging a surrogacy contract are prohibited. There are also provisions addressing what happens if the contract is breached or terminated. Texas’s law is modeled after Part 8 of the Uniform Parentage Act of 2002. A gestational agreement must be validated in court. The gestational mother may not use her own eggs. She must have had at least one prior pregnancy and delivery. She maintains control over all health-related decisions during the pregnancy. The intended mother must show that she is unable to carry a pregnancy or give birth. The intended parents must be married and must undergo a home study. There is a residence requirement of at least 90 days for either the gestational mother or the intended parents. An agreement that has not been validated is not enforceable, and parentage will be determined under the other parts of Texas’s Uniform Parentage Act. Virginia requires pre-authorization of a surrogacy contract by a court. If the contract is approved, then the intended parents will be the legal parents. If the contract is voided, the surrogate mother and her husband, if any, will be named the legal parents and the intended parents will only be able to acquire parental rights through adoption. If the contract was never approved, then the surrogate can file a consent form relinquishing rights to the child. But if she does not, the parental rights will vary based on whether either of the intended parents have a genetic relationship to the child. Depending on the circumstances, they may need to adopt in order to obtain parental rights. Notwithstanding all of the above, if the surrogate is the genetic mother, she may terminate the contract within the first six months of pregnancy. Virginia’s requirements for court approval include: a home study; a finding that all parties meet the standards of fitness applicable to adoptive parents; the surrogate must be married and have delivered at least one prior live birth; the parties must have undergone medical evaluations and counseling; the intended mother must be infertile or unable to bear a child; and at least one intended parent must be genetically related to the child. The intended parents must accept the child regardless of its health or appearance. The surrogate retains sole responsibility for the clinical management of the pregnancy. During the approval proceedings, the court must appoint counsel for the surrogate and a guardian ad litem to represent the interests of any resulting children. The court’s approval of assisted conception under the contract is effective for twelve months. Compensation beyond reasonable medical and ancillary costs is not allowed. Recruitment fees are punishable as a misdemeanor and the parties may collect damages from the broker. The law also provides for an allocation of costs when an unvalidated contract is terminated under various circumstances.